Great performances at Scottish Schools! There have been lots of great performances by our club athletes over the last two weekends at the Scottish Schools Championships! 3 shiny medals are coming back to the club, and this year they were all in throwing! 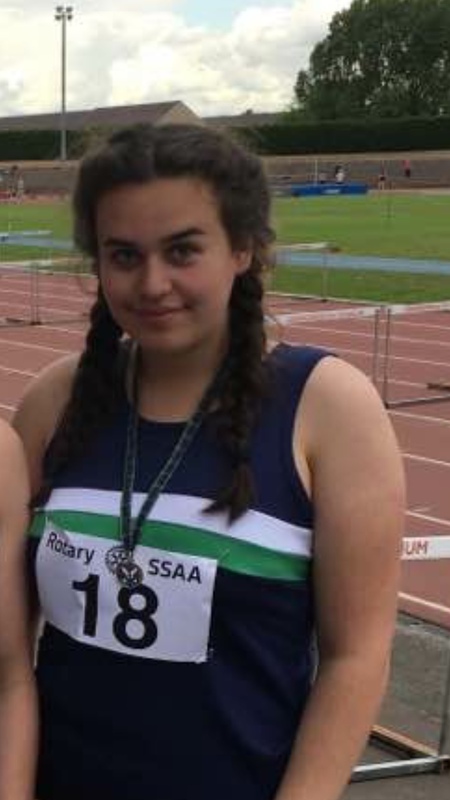 Stella started the championships by winning the GOLD medal in Group D Girls Hammer with a massive throw of 37.80, winning by nearly 20m!! Well done Stella! 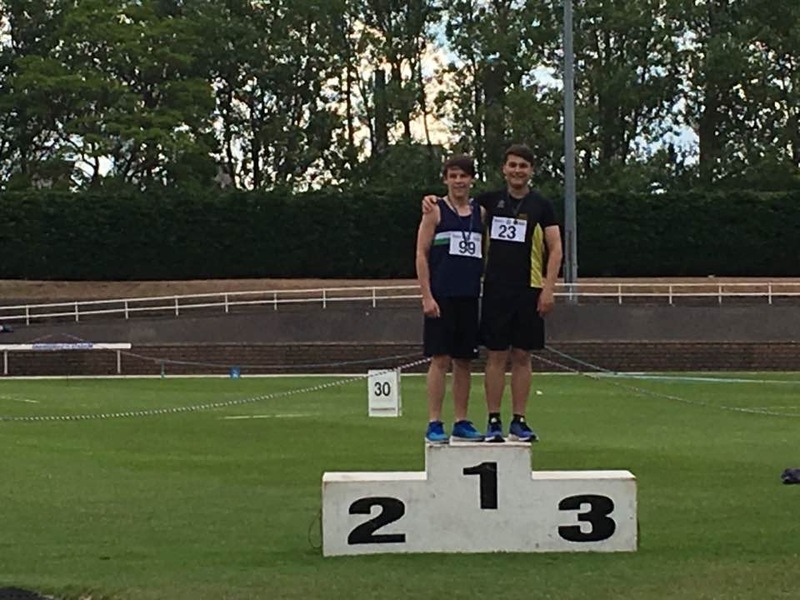 Next up was Calum Smith who threw a big PB throw of 35.46 in the Group C Boys Hammer to win the SILVER medal! Well done Calum! Jacob ran fantastically well in an extremely hard Group B Boys 1500m Steeplechase, coming 10th with a PB of 5:13.94. This was his first proper steeplechase competition in his first year of a tough age group, so he did extremely well! Well done Jacob! Hannah came 9th in the Group C Girls Pentathlon. Well done Hannah! Unfortunately Amy had to withdraw from the Group D girls Pentathlon with an injury. Beth ran extremely well to qualify for two finals of Group A girls, the 100m and the 100m hurdles. She finished 6th in the 100 and 4th in the hurdles, with good PBs. Well done Beth! Jamie jumped a height of 1.75m in the Group B Boys High Jump, just missing out on a medal against a strong field of boys. He also ran a great PB in the 100m Hurdles!. Well done Jamie! 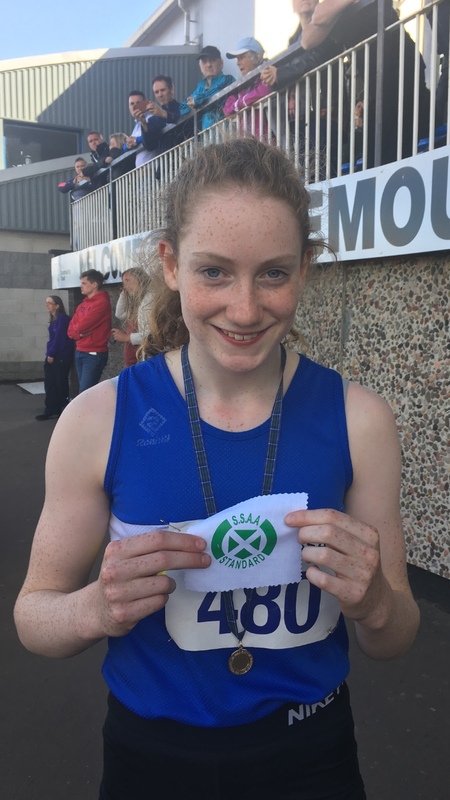 Hannah came 4th in the Group C girls Long Jump, with an excellent PB of 5.03m – a great result to break through the 5m barrier! Well done Hannah! Aimie took part in the Group C Long Jump too but unfortunately was struggling with injury so found it difficult to jump to her full potential. Calum ran a strong heat in the Group C Boys 800m to qualify for the final. Well done Calum! Nikkala ran a fantastic heat of the Group B 100m with a PB to qualify for the Semi-Final against tough competition. She then ran another PB in the semi-final! Well done Nikkala! Thomas came 7th in the Group B boys Triple Jump with a great jump of 11.77m. Thomas is consistently jumping close to 12m now which is a great achievement! Well done Thomas! Emma came 7th in the Group B girls Hammer, with a fantastic PB of 30.92m! Well done Emma! Hannah had a very tough competition in the Group C girls Javelin, where she came 10th with a great throw of 19.97m. Well done Hannah! Amy ran a PB in the Group D Girls 75m Hurdles before heading across to the Discus cage, where she won the GOLD medal with a PB of 28.67m! Well done Amy! Lucy ran a very strong heat in the Group A girls 800m to qualify for the final against very strong competition. Well done Lucy! All the club coaches want to say a huge well done to everyone who took part!